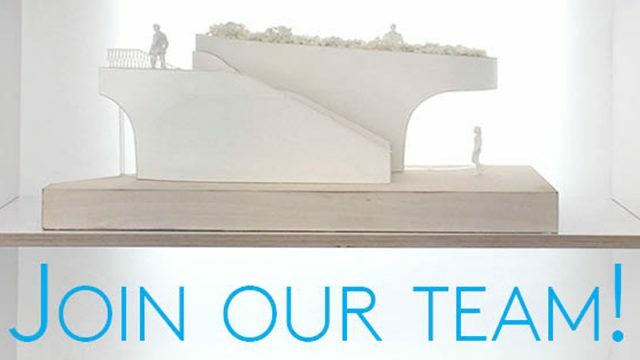 We have a vacancy for an experienced and ambitious Part II Architectural Assistant. The successful candidate will join our collaborative team to work on high profile UK cultural and mixed use projects won in international competition. Your role will be to assist project architects to run projects, and there is opportunity for the right candidate to take on significant responsibility. You will value architecture that is people centred and experience focused, and have a passion for material craft. Nex— have several projects under construction in 2017-18 which could make excellent case studies for Part III studies. — At least 2 years’ post Part II professional experience in the UK. — Strong design and representation skills. — UK Job experience of all RIBA Stages in refurbishment or new-build projects. — Excellent 3D modelling and documentation skills in Rhino and Revit. — Strong visualisation skills in Vray and Adobe suite or similar. — Good detailing ability with a broad UK technical knowledge. — Great written and verbal communication skills with experience of working with clients and project stakeholders. — Excellent organisational and time management, with demonstrated experience of working well under pressure. — Ready to be a proactive part of a small collaborative team, show initiative, and act autonomously. — Be eligible to live and work in the UK. — Have the ambition to complete Part III and develop into a future project leader. This position is available for an immediate start. A competitive salary will be offered based on experience, and we offer excellent mentoring, training and career development opportunities. — 17.04 PII Architectural Assistant in the subject line. — CV and supporting information describing your skills, experience and qualifications. Email file size should be under 5MB. We are an equal opportunities employer.